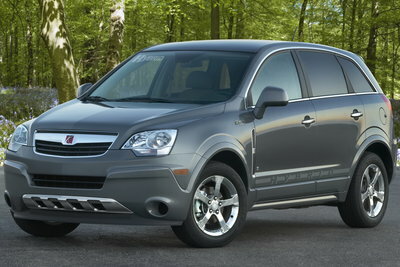 The second generation of Saturn's compact SUV is a significantly more refined vehicle than its predecessor. Saturn offers the VUE with a myriad of powertrain options including a four cylinder, two six cylinders, and two different hybrid systems. The newest hybrid model features GM's two-mode hybrid system paired with a 3.6L V6. For enthusiasts, the Vue Red Line with the 257-bhp/248 lb.-ft. 3.6L V-6 and 6-speed automatic is an obvious choice. With its firmly tuned suspension, the Vue Red Line is a fine handling SUV. An optional towing package allows the Vue to tow up to 3,500 lbs. Electronic Trailer Sway Control is part of the standard Stabilitrak stability control system. Available options include 17-inch alloy wheels, navigation system, heated front seats, cargo management system, and remote start. The Vue is a competitive alternative to the Honda CR-V, Toyota RAV4, and Ford Escape. The VUE will add a second hybrid/electric powertrain option. The VUE 2 Mode Hybrid features a unique transmission that can function as a CVT while running on electricity, but utilizes four-fixed gears for other operating conditions.